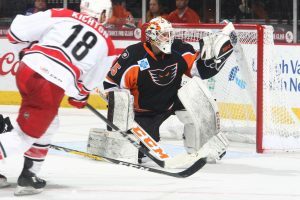 Lehigh Valley, Pa. – The Charlotte Checkers scored four power play goals and Alex Nedeljkovic authored a 26-save shutout Saturday evening as the Checkers claimed Game 2 of the Atlantic Division Finals with a 6-0 win in front of 6,335 fans inside PPL Center. With Saturday’s result, the best-of-seven series is now tied at one game apiece. After back-to-back showdowns in downtown Allentown this weekend, the series now shifts to Bojangles’ Coliseum in Charlotte for the next three games, including Game 3 this Tuesday, May 8 followed by Game 4 on Wednesday, May 9. 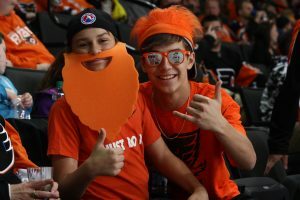 Phantoms fans are encouraged to attend the team’s Official Playoff Watch Parties at Chickie’s & Pete’s at PPL Center this Tuesday and Wednesday evenings beginning at 6:30 p.m.
Saturday’s contest snapped a 10-game home winning streak for Lehigh Valley as the Phantoms absorbed their first regulation setback at PPL Center since a 3-2 decision against the Bridgeport Sound Tigers back on March 9. 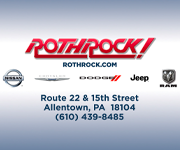 What’s more, Saturday’s result was just the team’s second regulation loss at home since January 13 as Lehigh Valley has posted a sensational 20-2-2 mark in downtown Allentown over the club’s last 24 home tilts. 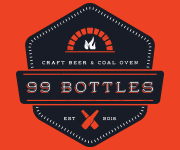 Janne Kuokkanen (2nd, 3rd) scored twice for visiting Charlotte while Trevor Carrick, Andrew Miller and Andrew Poturalski each chipped in a pair of assists for the Checkers in front of Nedeljkovic who notched his first career postseason shutout following five clean sheets during the regular season. 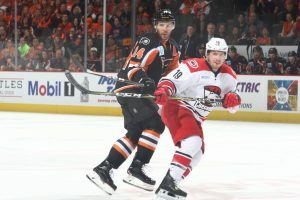 After scoring just one power play goal through the team’s first four playoff outings (1-for-17), the Checkers went 4-for-8 on the man-advantage Saturday evening while Lehigh Valley was unable to convert in its six power play opportunities. 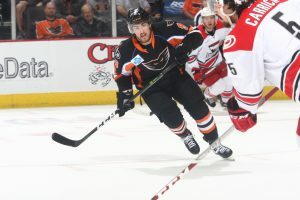 Saturday’s game did mark the welcome return of defenseman Samuel Morin to Lehigh Valley’s lineup after the 22-year-old blueliner had missed the previous 39 games due to injury. 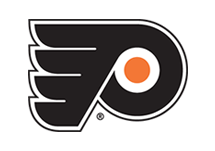 In fact, Saturday’s contest marked the first appearance since a January 20 showdown at the Hershey Bears for the former 11th overall selection in the 2013 NHL Entry Draft. 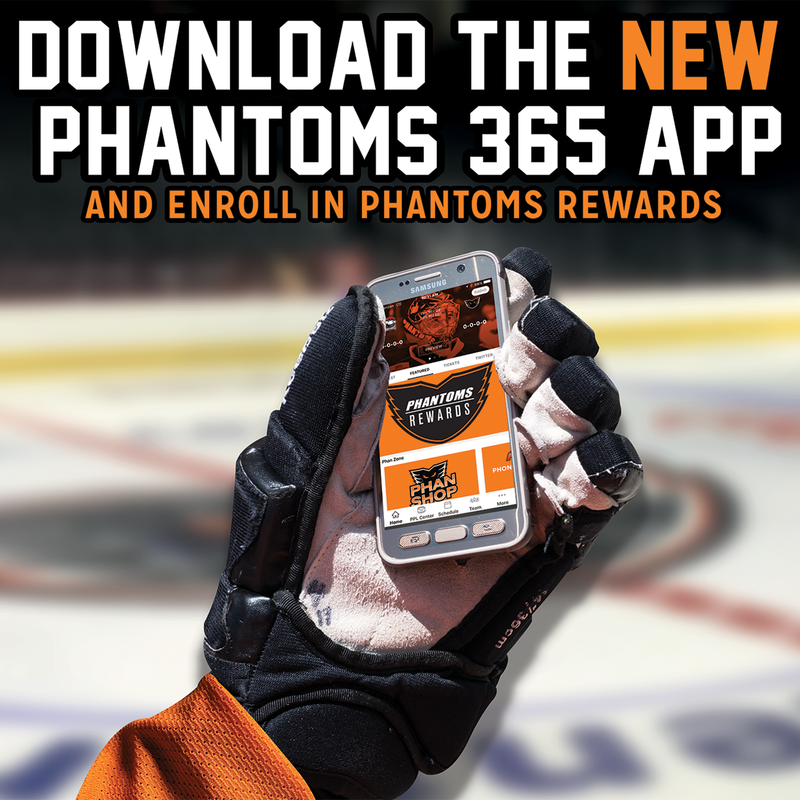 Charlotte opened the scoring just over six minutes into the contest when, while on the power play, Miller feathered a pass into the slot that was beautifully redirected by Kuokkanen into the back of the Phantoms’ net for his second goal of the playoffs. Miller and Brenden Kichton assisted on the man-advantage marker notched 6:04 into the first frame as the Checkers opened the scoring for the second time in as many games in the series. 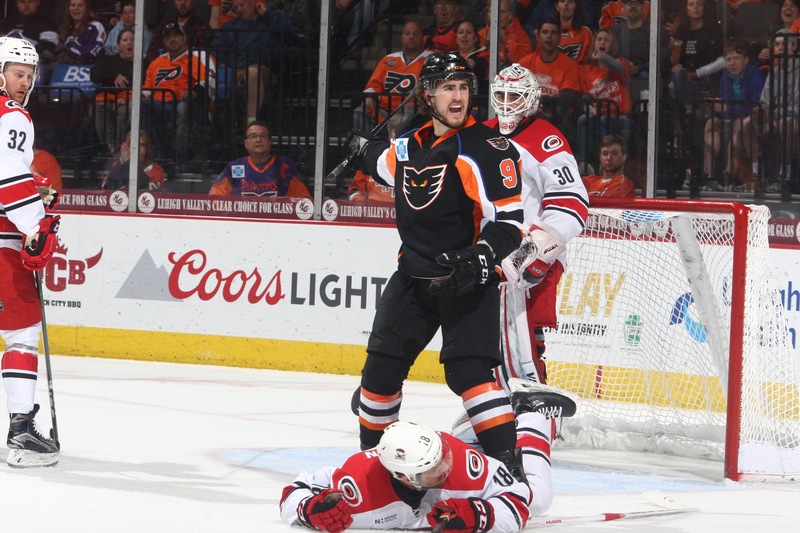 Charlotte doubled its advantage just under 10 minutes later when a turnover by Oskar Lindblom in the offensive zone produced a two-man breakaway between Miller and Lucas Wallmark resulting in Wallmark’s third goal of the postseason. 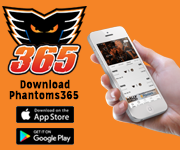 Phantoms’ goaltender Dustin Tokarski displayed tremendous athleticism on the play but wasn’t able to keep the four-on-four conversion out, which came exactly 16:02 into the opening period of play. 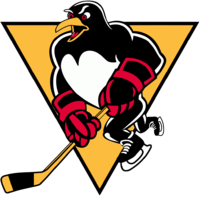 The Checkers then swelled their lead to a 3-0 edge 13:30 into the middle frame when Roland McKeown’s slap pass from the right point was perfectly deflected by Philip Samuelsson in the slot for Samuelsson’s first conversion of the playoffs. Poturalski collected the secondary assist on the even-strength strike, which was Samuelsson’s first marker since a February 13 conversion against the Hartford Wolf Pack (30 games). Charlotte closed the second period with a pivotal power play conversion in the final minute of the frame when Valentin Zykov slammed home his second goal of the series and third this postseason. Poturalski and Trevor Carrick assisted on the man-advantage marker buried 19:04 into the second stanza. The Checkers then added some insurance with two more power play tallies in the dying moments of the third period. 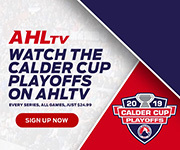 First, Kuokkanen netted his second goal of the game and third of these playoffs 19:18 into the final frame before Julien Gauthier capped the evening’s scoring with his first goal of the playoffs. Nicolas Roy and Warren Foegele assisted on Gauthier’s man-advantage strike that came 19:50 into the third period. Tokarski finished the evening with 17 saves on 23 shots as the 28-year-old netminder moved to 1-1 this postseason and is now 15-7 in 24 career AHL postseason outings. 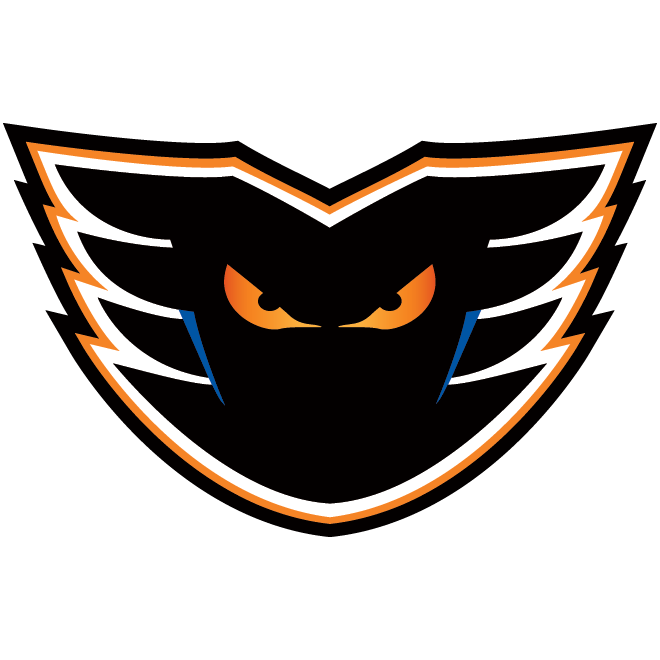 In the midst of the club’s 12th postseason appearance in franchise history, the Phantoms have captured two Calder Cup Championships (1998, 2005) and carry a 62-54 overall mark in 116 career AHL postseason outings. This is the fifth regular season division title in franchise history and the team’s first since arriving in the Lehigh Valley. 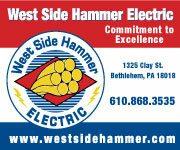 Be here for every home playoff game in your same great seats with the Playoff strip. 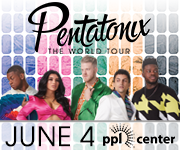 The “pay as we play” option offers a convenient payment plan and the largest discount on tickets.